Members of the Hermiston Bulldogs lift their helmets acknowledging the home crowd followng their 42-21 win over Corvallis on Friday night. Hermiston travels to Glencoe for game on November 21. HERMISTON - The Hermiston Bulldogs defeated the Corvallis Spartans on Friday, November 14 by a score of 42-21 in second round OSAA 5A football action. Hermiston will now go on to play Glencoe on Friday, November 21. The Corvallis Spartans took the opening kickoff and scored their first touchdown in five plays. The Spartans were sitting third and nine on the 46 yard line. Quarterback Ross Orman pitched to Dominic Wooten who ran right, breaking a couple of tackles and going 46 yards for the touchdown. Orman kicked the point after giving the Spartans the 7-0 lead. Hermiston couldn't move the ball in their first possession and the Spartans took over after the punt on their six yard line. 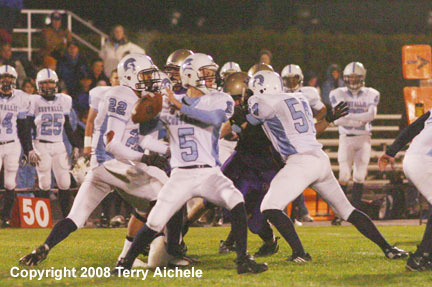 The Spartans were second and thirteen on their own three yard line when Orman pitched to Wooten who fumbled the ball. The Dawgs recovered the ball on the five yard line. Hermiston quarterback Faafiula Ena handed off to Tyler Green who ran it in for the touchdown. Luis Ortiz kicked the point after tieing the game 7-7 at 8:14 of the first quarter. Corvallis kick returner Chase Patton took the kickoff to the Spartan 21 yard line. On the first play Spartan quarterback Orman had his pass batted up in the air, a Bulldog grabbed it and made it to the nine yard line. So the Bulldogs were first and ten on the Corvallis nine yard line with 7:57 to go in the first quarter. Green carried the ball to the four yard line. Next play Ena set up and threw to Adam VonArx for the touchdown. Ortiz hit the point after and within one minute Hermiston was now ahead 14-7. Corvallis settled down on their next possession. 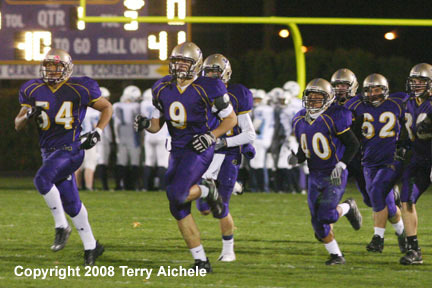 In seven plays the Spartans were second and sixteen on the Hermiston 26 yard line. Orman threw a pass to the left side good for a touchdown. The extra point was good tieing the score at 14-14 with 3:41 to go in the first quarter. 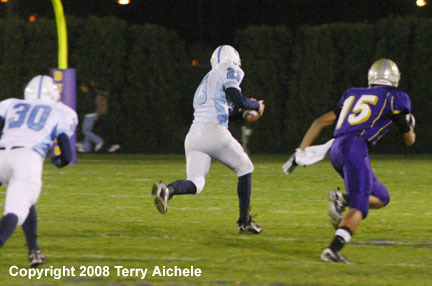 Hermiston was moving the ball on their next possession until the fifth play of the series. Faafiula Ena had his pass picked off by Cory England who ran it 36 yards for a touchdown. Corvallis hit the extra point and took a 21-14 lead. with 28 seconds to play in the first quarter. Hermiston took the kickoff and in six plays were on the Spartan's 26 yard line. On second and eleven Ena took the snap and ran 26 yards for a touchdown. Ortiz made the extra point and Hermiston tied it up 21-21 at 10:33 of the second quarter. Hermiston took possession of the ball at 6:07 of the second quarter. On the seventh play of the series Ena threw a pass to Johnny Kayembe for a fifteen yard touchdown. Ortiz hit the extra point giving Hermiston the 28-21 lead with 4:03 to go in the half. Hermsiton next took possession at 3:10 to go in the half on the 41 yard line. On the eighth play Ena threw a pass to Green. Green runs it in for a 47 yard touchdown pass completion with 13 seconds to play in the half. Ortiz hit the extra point giving Hermiston the 35-21 lead going into the closing seconds of the first half. Hermiston took the opening kickoff of the second half and stalled on their own 41 yard line. Corvallis quarterback Ross Orman connected with a pass to Chase Sanders who took the ball to the Spartan 25 yard line. On second and fifteen Orman fumbled the ball which was recovered by Hermiston on the 15 yard line. On the first play from scrimmage with 8:51 to go in the third quarter Ena threw a pass that connected with Anthony Montez for a touchdown. Ortiz hit the extra point to give Hermiston the 42-21 lead and ultimately that was the final score. The balance of the game had some tough defense but no scoring opportunities for either team. LEFT - Hermiston players come onto the field just minutes before the start of the game. RIGHT - Corvallis quaterback Ross Orman sets up to throw a pass during the Spartans first possession. Hermiston quaterback Faafiula Ena sets up to throw a pass during the first half of the game on Friday. LEFT - Cory England of Corvallis picked off a Faafiula Ena pass and took it 36 yards for a touchdown. 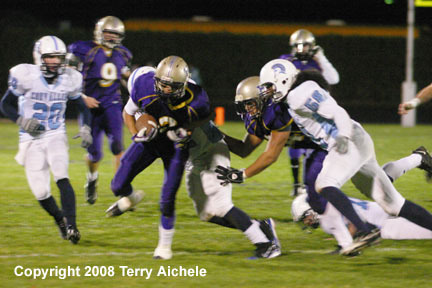 RIGHT - Hermiston running back Luiz Ortiz on a carry into a group of Spartan defenders. 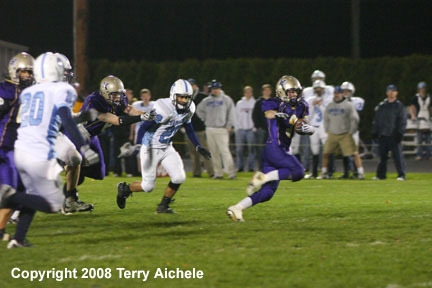 LEFT - Tyler Green of Hermiston breaks into the clear on a big gain for the Bulldogs. RIGHT - Hermiston quaterback Faafiula Ena carries the ball for a touchdown. Tyler Green of Hermiston finds an opening on a run. 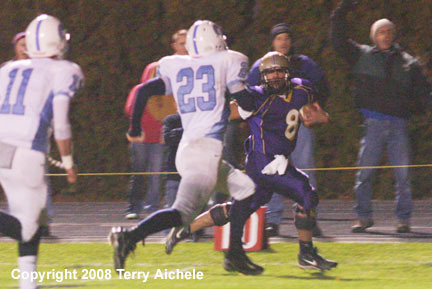 LEFT - Tyler Green of Hermiston on a running play. 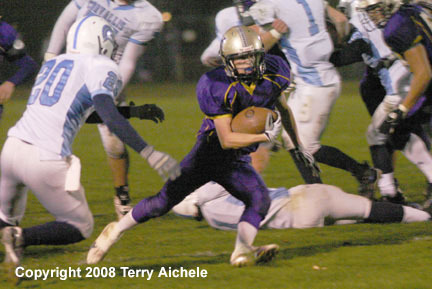 RIGHT - Tyler Green of Hermiston on a running play. 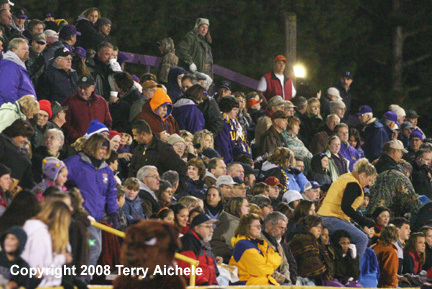 LEFT - Hermiston fans. RIGHT - A Hermiston cheerleader. 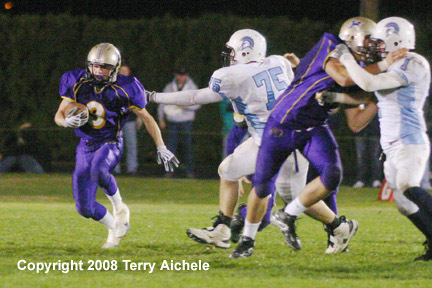 LEFT - Tyler Green of Hermiston tries to get past Dustin Shear, a Spartan defender. 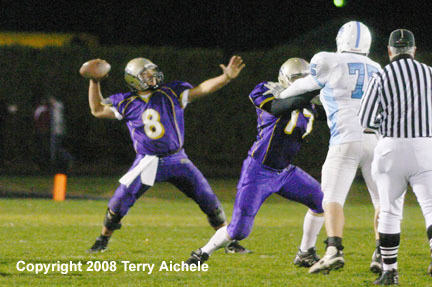 RIGHT - Faafiula Ena of Hermiston sets up to throw a pass. 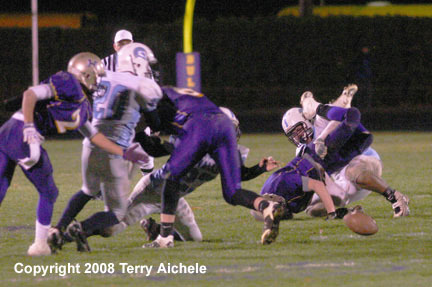 LEFT - A ball comes loose after a Hermiston player fumbles. 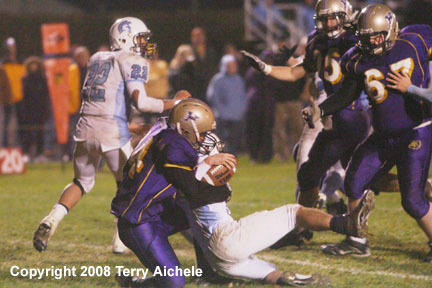 RIGHT - Ross Orman, the Spartan quarterback, is sacked by Lale Ena.